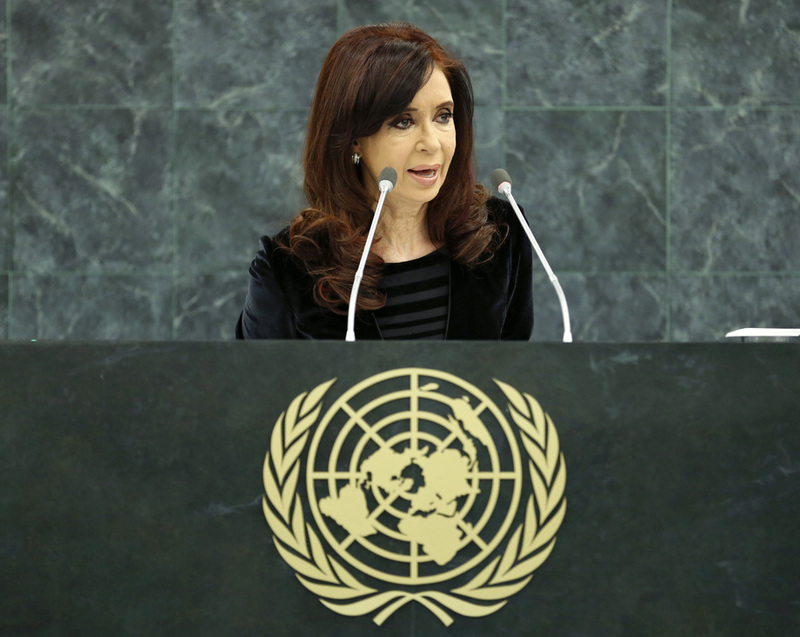 CRISTINA FERNÁNDEZ, President of Argentina, expressed solidarity with the victims of terrorist attacks in Kenya, Pakistan and elsewhere around the world, saying her own country had also been a victim of such attacks, in reference to the 1992 attack on the Israeli embassy and that of 1994 on the Asociación Mutual Israelita Argentina (AMIA) building, both in Buenos Aires. Some family members and relatives of the victims in those two incidents had accompanied her to the general debate, she said, calling for solidarity and condemnation of all terrorist actions. Turning to Syria, she said the way in which the Security Council operated had proven to be obsolete, as exemplified by its handling of the crisis in Syria. When it came to conflict management, veto power in the hands of interested stakeholders became an obstacle to solving the problem. The international community had responded strongly to the chemical attack on 21 August, but the crisis had been going on for two-and-a-half years, with most of the casualties having been caused by conventional weapons, she pointed out. Questioning the delay in handling the Syrian crisis, she called for the much-needed reform of the Security Council. Meanwhile, she welcomed the recent agreement on Syria, stressing that Argentina opposed direct intervention in or the bombing of Syria. On its dispute with the United Kingdom over the Malvinas ( Falkland Islands), she said the Special Committee on Decolonization had approved numerous resolutions calling for the two countries to solve the issue through dialogue. Regrettably, the United Kingdom had been disregarding those calls. Expressing hope that the new Government of Iran would bring about change, she said that due to the suspected involvement of Iranian citizens in the AMIA bombing case, Argentina had repeatedly called on Iran to cooperate with the investigation. A year ago, the Iranian Government had agreed to engage in talks to seek a solution. While the Argentineans were neither naïve nor foolish, they believed in the goodwill of others and in their wish for peace, she said, stressing that Iran deserved a chance to show the world that it would be different. She went on to talk about her country’s disputes with certain hedge funds holding its defaulted bonds, referring to them as “vulture funds”. In 2001, Argentina had been forced to default on its debt. However, it had then managed to strike a deal with more 90 per cent of its creditors to restructure its debt at a discounted rate. The country had been consistent and timely in repaying its debt and lowering its debt-to-GDP ratio, but the “vulture funds”, which had bought most of the debt at a great discount after the default, wanted to collect much more than they had paid, she said, adding that Argentina would continue to pay its debt in the same way that it had been doing.